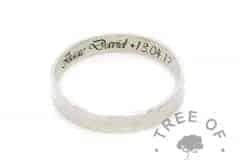 These totally handmade sterling silver rings, able to be engraved with text. 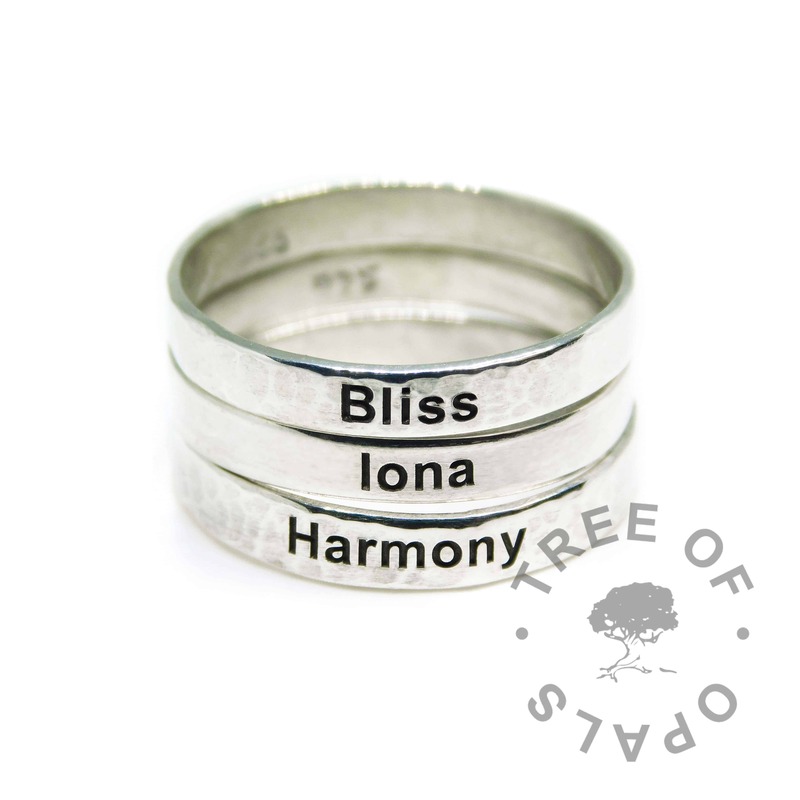 You can click here to add a bubble or twisted band ring to your stack. Please note, these are custom accessories and will not contain your elements (such as ash). Scroll down for the full product listing. 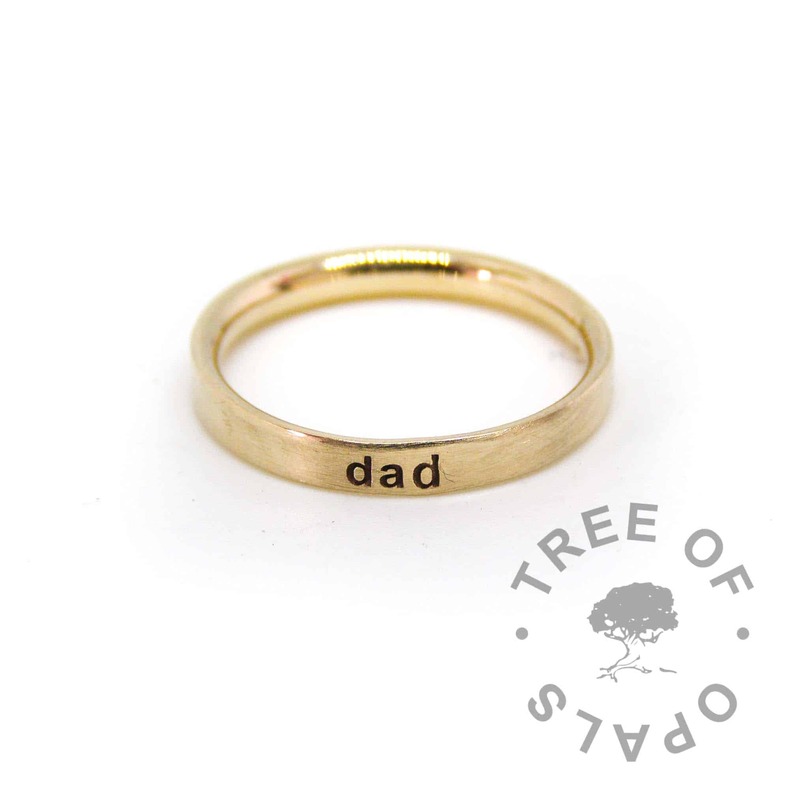 You can order our wide band stacking ring by itself or in addition to a cremation ash ring, lock of hair ring or umbilical cord ring. 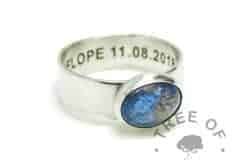 Many clients choose to have their jewellery engraved with a message of love, remembrance, dates and names. You can see some examples of memorial quotes here. 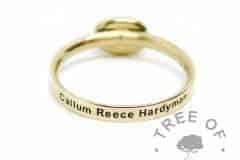 Engraving is done in Arial but please let us know if you’d prefer another font such as Times New Roman, Vivaldi or Amazone BT, in the comments of the product before adding the ring to the basket. Add your text, up to 60 characters – upper and lower case, numbers and punctuation in your chosen font. 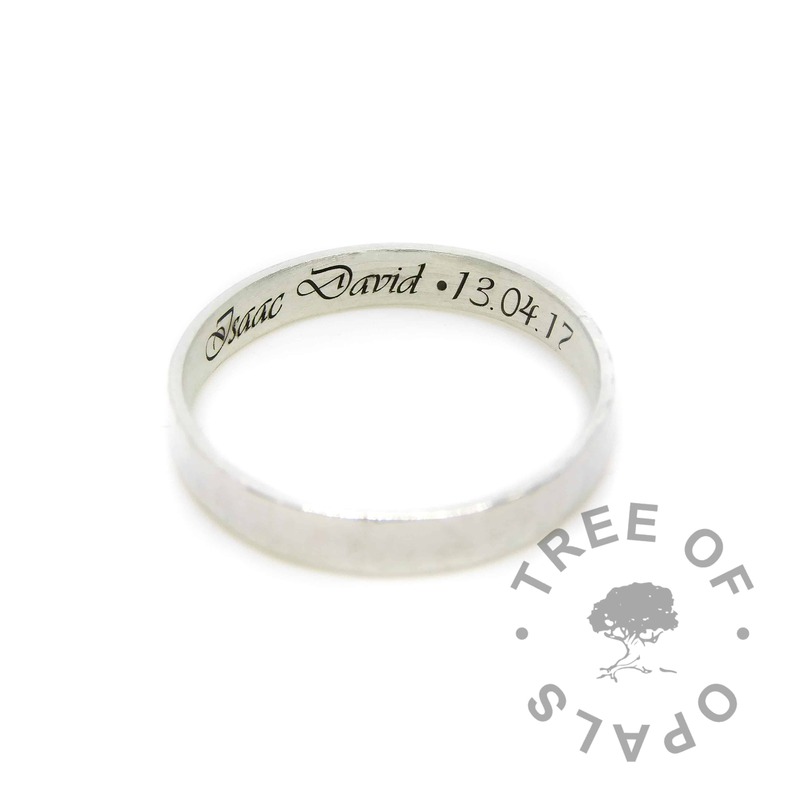 You can choose Roman numerals, birth, marriage or death coordinates (we’re happy to help you work that out), or messages of love, hope, and remembrance. We are even happy to include more “colourful” language. The more letters you choose, the smaller the writing will be. 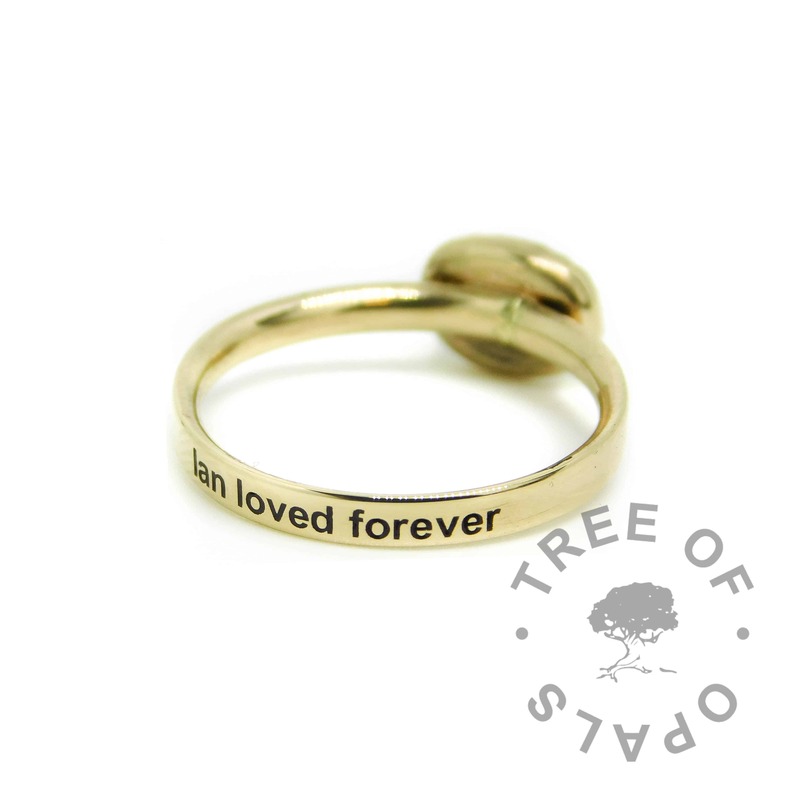 We recommend Arial or Times New Roman for long messages, and handwriting fonts like Vivaldi or Amazone BT are great for short messages and on larger pieces like the silver large heart engraved pendant and the 6mm shiny wide ring option. Here are some special characters you can copy and paste. 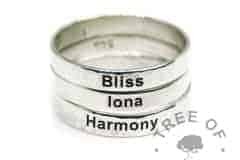 These rings will be 925 stamped but not hallmarked due to weight. You can choose an effect for the metal and we have a variety of patinas and effects (click here) that will sit in the low points of the ring. 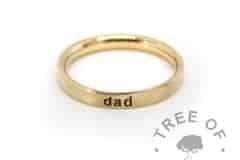 These show up beautifully in textured and and engraving. 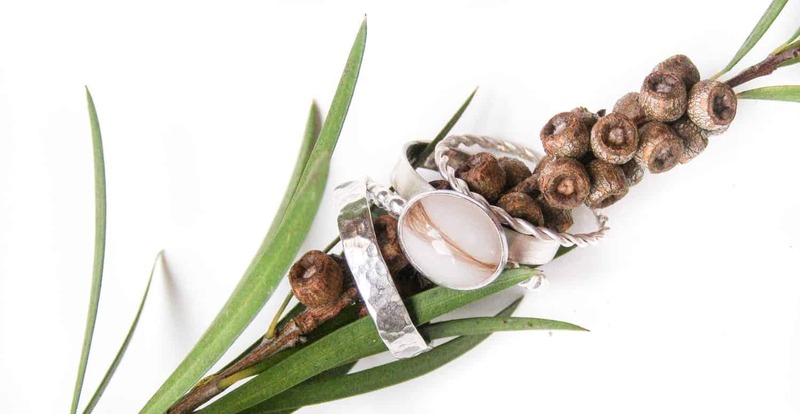 The rings are not mass-produced, they are not cast or polished to perfection – they are beautifully handmade and you can see examples of the quirks which make them unique in the gallery. 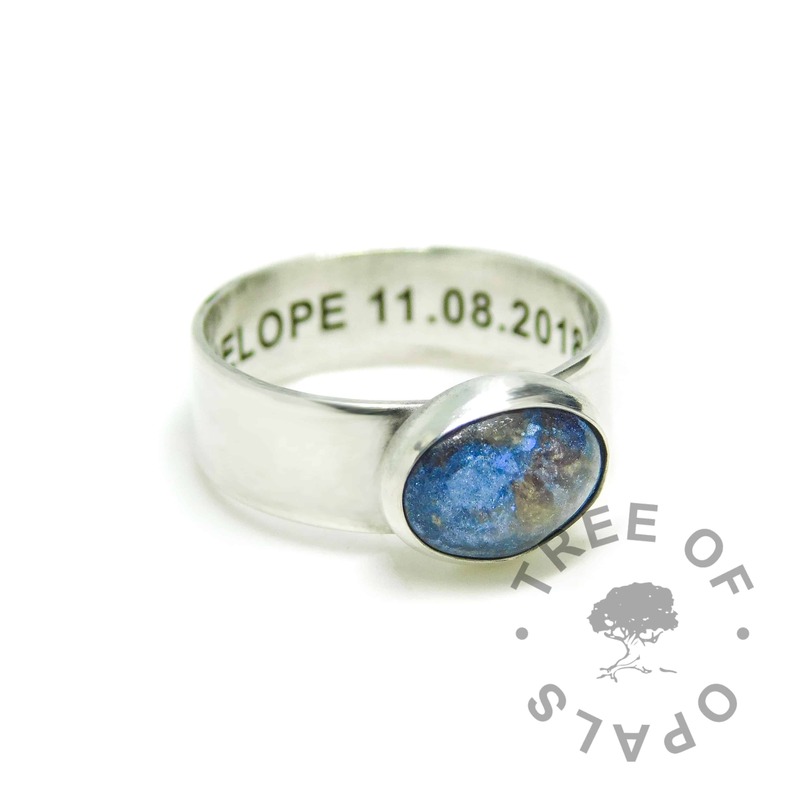 There is more information on our metalsmithing in the terms and conditions. 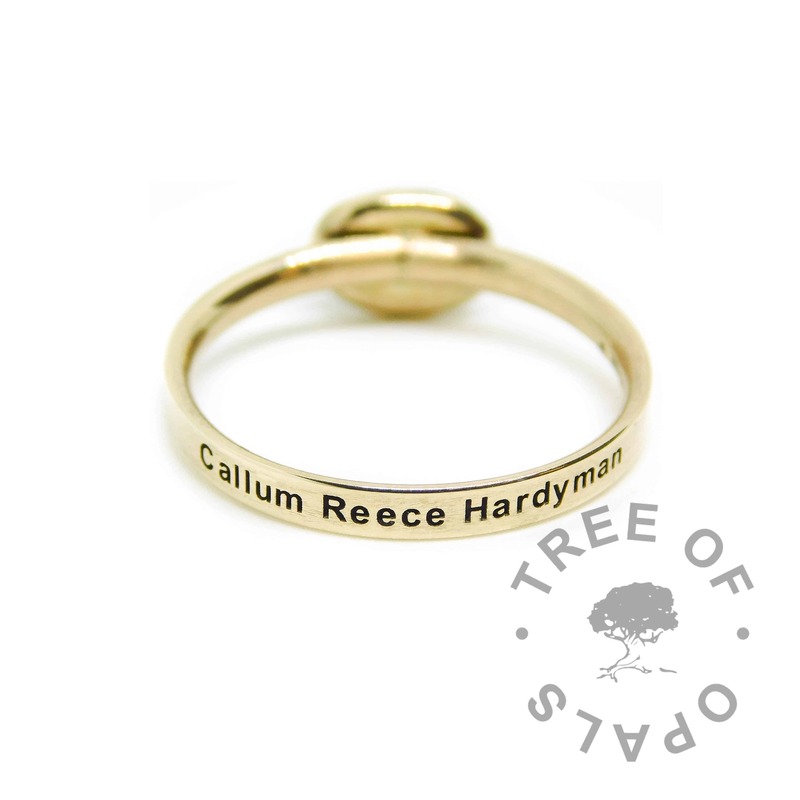 You can click here to add a bubble or twisted band ring to your stack. New: Limited Edition wide heart band and wide crown band rings! Please check out our FAQ page and the T’s and C’s in full before ordering as they are very important. 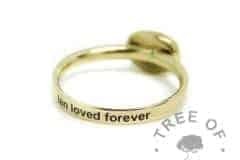 Beautiful ring, exactly as I ordered. It looks beautiful with my lock of hair ring. There was a problem with the ring I received first and Nikki was fantastic and sorted everything out perfectly so the replacement was with me very quickly. So pleased I got this ring to sit next to my ashes ring. They sit beautifully together.